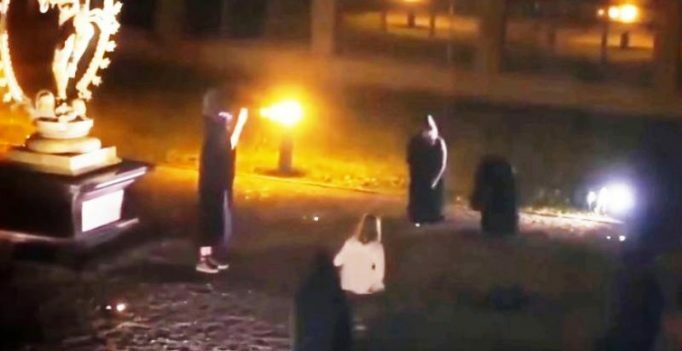 The European Organisation for Nuclear Research (Cern), best known for its work in particle physics, has launched an investigation into a video filmed at night on its Geneva campus depicting a mock ritual human sacrifice, a spokeswoman said on Wednesday. The bizarre video which has been circulated online shows several individuals in black cloaks gathering in a main square at Europe’s top physics lab, where a large sized idol of Nataraj, the dancing posture of deity Shiva, is on permanent display. The video shows the ‘stabbing’ of a woman in what appears to be a re-enactment of an occult ceremony. A Cern spokeswoman confirmed the video was shot on the research centre’s premises, but without “official permission or knowledge”. Responding to an email query, she said, “Cern does not condone this type of spoof, which can give rise to misunderstandings about the scientific nature of our work.” An investigation was under way and was an “internal matter”, she added. The video appears to have been shot by someone spying on the enactment, who seemingly panics when the ‘stabbing’ takes place. The videographer then turns around and sprints away, the camera still on. The last frame of the video appears to catch a glimpse of the Large Hadron Collider, Cern’s prized possession and the world’s most powerful particle smasher that scientists are using to understand the universe. The video, which was posted around four days ago, has raised questions about security on Cern’s campus. “Cern IDs are checked systematically at each entry to the Cern site whether it is night or day,” the spokeswoman said, indicating that those responsible for the prank had access badges. “Cern welcomes every year thousands of scientific users from all over the world and sometimes some of them let their humour go too far. This is what happened on this occasion,” she said. 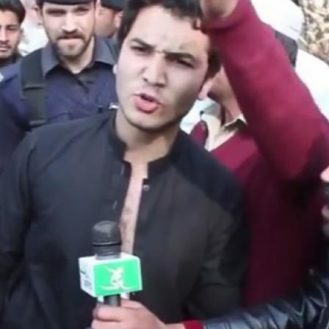 No information has been revealed about the identity of those in the video. Geneva police said they had been in contact with the centre but were not involved in an official investigation.